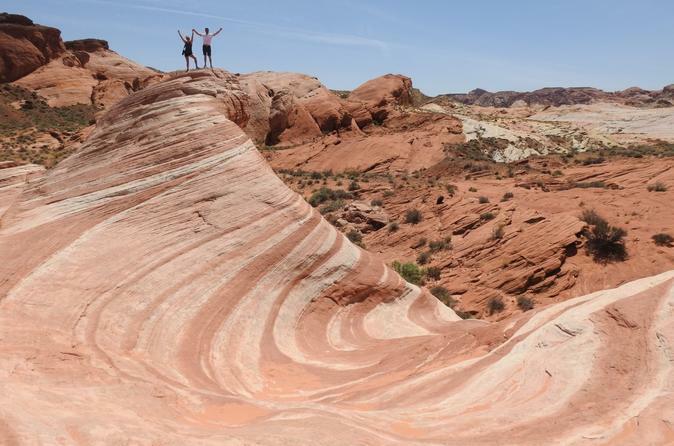 Come see the 2 most popular features of Valley of Fire; Fire Wave and Elephant Rock. Your guide Adam will pick you up from your Las Vegas accommodation and bring you directly to each magnificent location. There is not much hiking involved but more of short walks. You will have plenty of time for photo opportunities either with your camera or Adam’s. That’s right! Adam will even take photos for you. This adventure is for anyone that wants to spend a relaxing 4 hours away from the busy casinos. Tour includes transportation, guide, water, juice, and snacks. Pickup times will range from 6am to 7am depending on how many are in the group. We will drive the scenic one hour trip to Valley of Fire where Adam will get to know the group and share a ton of fun facts about the area. Our first stop will be made at the iconic Elephant Rock where we will hike less than a half mile to see it. You will spend 45 mins at Elephant Rock where you will have opportunities to climb on the sandstone to see a view of Lake Mead or you can explore some of the many interesting rock features found on level ground. We will than drive to the opposite side on the park (10 mile SCENIC drive) to the awe inspiring Fire Wave. We will hike approximately 1 mile round trip through mostly soft loose sand or hard sandstone. Our path will wind through a colorful canyon that will bring us to Fire Wave. You will see cacti and other amazing rock features along the way and there’s is always a chance to see some wildlife as well. You will have plenty of time to get your photos of Fire Wave once we arrive. Adam will have plenty of backpacks to use and will be able to carry most of the water that will be needed. We will drive one hour back to Vegas and you will return back to your hotel approximately 4 hours after Adam picked you up.